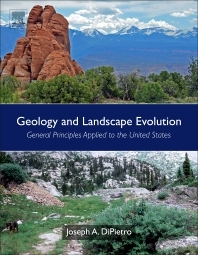 Geology and Landscape Evolution: General Principles Applied to the United States, Second Edition, is an accessible text that balances interdisciplinary theory and applications within the physical geography, geology, geomorphology and climatology of the United States. The vast diversity of terrain and landscape across the United States makes this an ideal tool for geoscientists worldwide who research the country’s geological and landscape evolution. The book provides an explanation of how landscape forms, how it evolves and why it looks the way it does. This new edition is fully updated with greater detail throughout and additional figures, maps, drawings and photographs. Rather than limiting the coverage specifically to tectonics or to the origin and evolution of rocks with little regard for the actual landscape beyond general desert, river and glacial features, this book concentrates specifically on the origin of the landscape itself, with specific and exhaustive reference to examples from across the United States. The book begins with a discussion of how rock type and rock structure combine with tectonic activity, climate, isostasy and sea level change to produce landscape and then explores predicting how landscape will evolve. The book goes on to apply those concepts to specific examples throughout the United States, making it a valuable resource for understanding theoretical geological concepts through a practical lens. Joseph A. DiPietro is Professor of Geology at the University of Southern Indiana. His research interests are in the fields of structural geology, tectonics, and metamorphism. He has been on the faculty at University of Southern Indiana since 1991 where he teaches Physical Geology, Landscapes and Geology of North America, Mineralogy, Structural Geology, and Tectonics. Most of his research has been on the tectonics of the Pakistan Himalaya where he mapped along the suture zone that separates India from Asia. He has also worked for the New York State Geological Survey mapping in the Adirondack Mountains and for the Idaho Geological Survey mapping in the Clearwater Mountains. He has also conducted mapping and research in the Green Mountains of Vermont.